Well I’m finally getting around to posting this recipe. I crafted this after I found myself with an abundance of smoked salmon over the holidays. Being a pescatarian people tend to give me lots of smoked salmons as gifts during the holiday season. Not that I’m complaining, but I felt I needed to come up with some more creative ways to eat the bounty of smoked salmon. 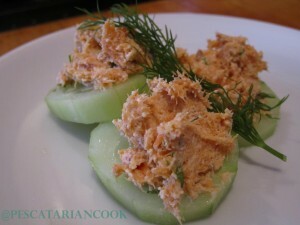 Traditional smoked salmon spread is always a treat, but I wanted to find a way to make this dish dairy free so I went on a quest on how to make vegan cream cheese and found this amazing recipe that works great. It was posted by Leanne Vogel on her blog Healthful Pursuit, and I’ll tell you what it is pretty darn close to the real deal! Mix all the ingredients together in a bowl and chill. This is a refreshing treat when served over freshly sliced cucumbers!